Breakfast. If, by chance, you didn't happen to notice, breakfast is my favourite meal of the day. It's also the most important, and it's easy to see why. You've not eaten for probably about 10 hours, so your body is in need of fuelling; it provides the nutrients you need for your body to make the transition from night time maintenance to day time work. It sets you up for the day, both physically and psychologically. I know that when I have a crappy breakfast, be it burned or rushed, I'm not in as good a mood as I could be and that impacts my work - be it writing, working out, or just my general approachability. So I always make a point of ensuring a good breakfast. Seeg has suggested that another reason I love breakfast so much is because I treat it like a dessert. I always have fruity breakfasts, never savoury - not because I'm against it, just simply because it's what I want. Everything else I eat that day will be savoury, and dessert itself is a rarety. Most days I don't have the time to make something very exciting, but I have found overnight oats to be a winner (I love porridge) because I can get up in the morning a little easier knowing my breakfast is all ready and waiting for me as I stumble down the stairs. But when I do have the time, I like to reach for something different. Pancakes are apparently the only socially acceptable form of cake that you can have for breakfast. For some reason it matters if the mixture is cooked in a pan or in the oven. Go figure. But while it is a breakfast staple, it's easy for pancakes to become unhealthy. Overload them with sugar or syrups and, while delicious, it's not as healthy as it could be. I don't know about you, but if I have refined sugar in the morning, I'm much more likely to eat it again over the course of the day. So, I don't typically add any sugar, syrup or sweetener to my pancakes, though I may very occasionally add a little bit of chopped dark chocolate or high-cocoa white. Otherwise, I prefer to rely on fruit or yogurt for sweetness, but this also means that my chosen pancake recipes or mixes are suitable for savoury use too, should I wish to break away from the norm (I don't). Wolf + Scott is a new brand of pancake mix rising over the horizon - organic, non-GMO, vegan, high in protein, fibre and omega-3 fats. Win, win, win win win. 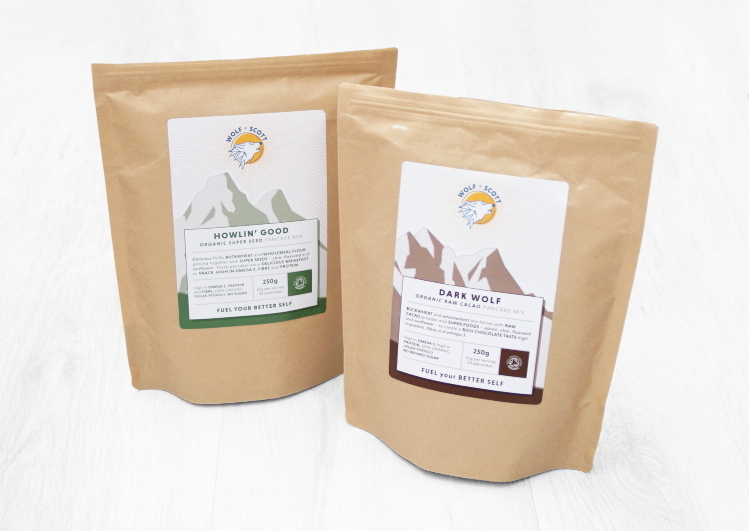 For the moment, they have only two mixes - 'Dark Wolf' cacao and 'Howlin' Good' super seeds. Both are made of a mix of organic wholewheat flour, buckwheat and flaxseed, neither are sweetened and both are free of any refined ingredients. They're perfectly adaptable and, frankly, delicious on their own. But when I was let at them they did become a little bit more special. 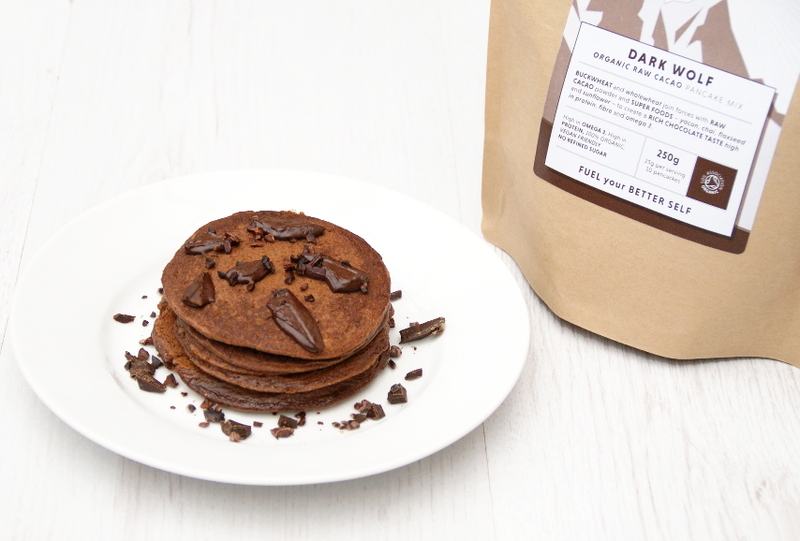 I usually add raw cacao powder to a plain pancake mix, but I found that Wolf & Scott's Dark Wolf pancake mix exceeded my usual recipe without any interference on my part, which is what we always like to see - especially when they're guilt-free. I did add some chopped dark chocolate and cacao nibs on top, however, which did add a little sweetness and another level to both the chocolate and the texture. In short, yum. The Howlin' Good seed mix was very fine - I had expected to see more obvious evidence of the seeds - and resulted in pancakes which were just as light as Dark Wolf. I added some honey greek yogurt, warmed blueberries and seed mix on top of this one - I was feeling cheeky that morning - and they came out just as deliciously. I have since made another batch with some banana slices and the subtle nutty taste came through wonderfully. Delightfully fluffy, though I have taken to adding a scoop of protein powder to the mixture and that, as it often can, does result in a denser pancake. But I quite enjoy them that way, which is why I persist in doing so. 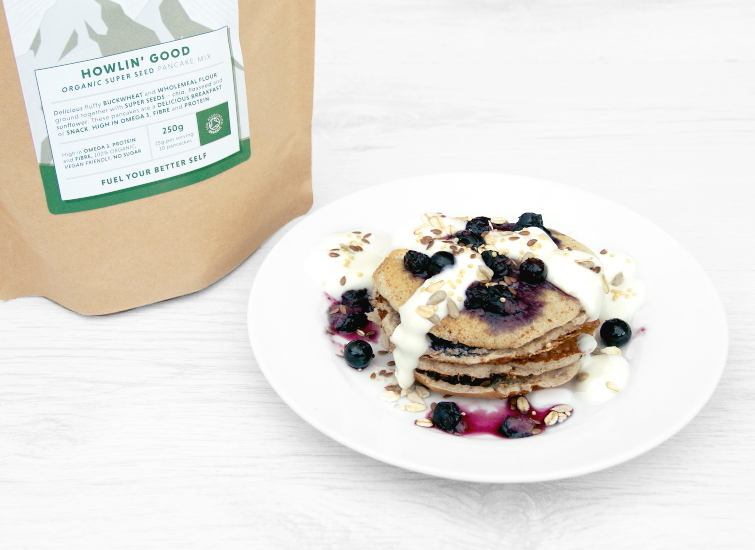 Each 250g pouch can make 10-12 pancakes, and each 25g serving is just 80 calories. 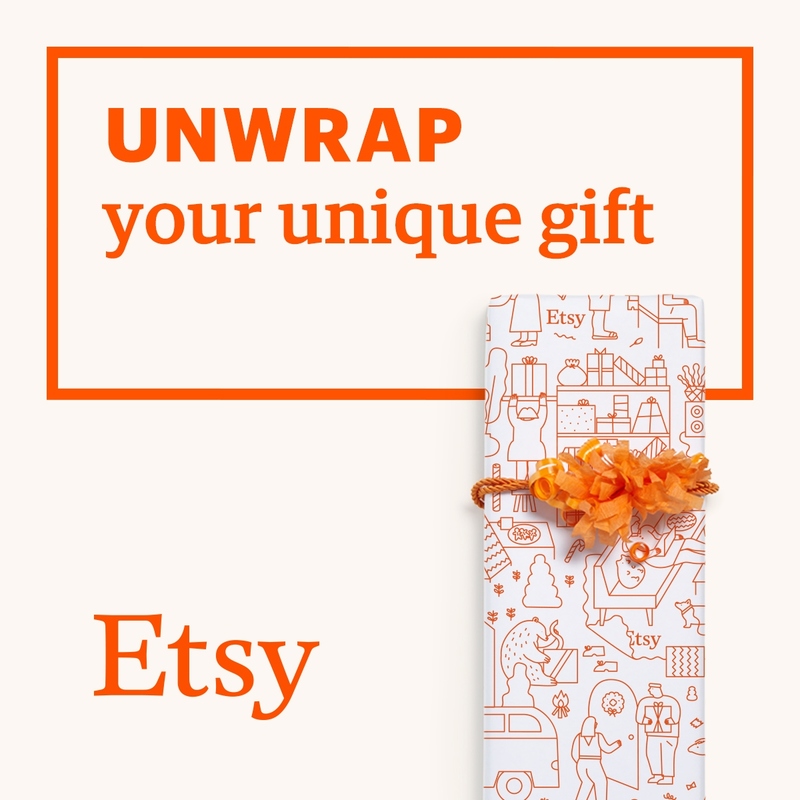 It does, of course, depend on how big you make them - I opt for small ones, about 4-5 inches, and even then only a stack of 4. I get there using either 50g of mixture, or 25g of mix with 20g additional whey protein powder, and 70ml skimmed milk. Both result in a small 4-5 piece batch at 180-200 calories, leaving the perfect amount of room for fruit, yogurt, seeds, nuts and chocolate, should I feel so inclined. 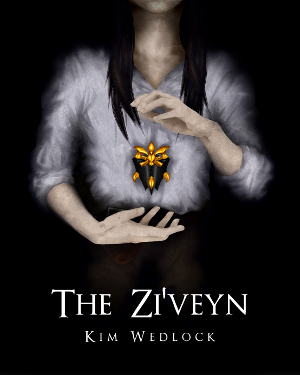 Buy directly from Wolf + Scott - and don't forget to use my reader-exclusive discount! Add the code ABE25 to your order for 25% off of all Wolf + Scott pancake mixes!